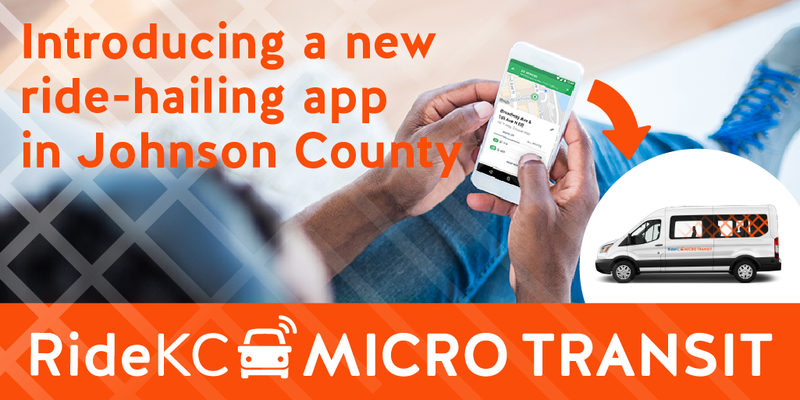 RideKC is working with an app partner to offer a 6-month ride-hailing micro transit pilot in Johnson County. Micro Transit service operates Monday-Friday from 6 a.m. to 8 p.m. Fare is $1.50 per trip. You can take Micro Transit anywhere within the service area shown below, which is bounded by 63rd Street and Shawnee Mission Parkway on the north, Metcalf on the east, Renner Rd. on the west and 119th on the south. 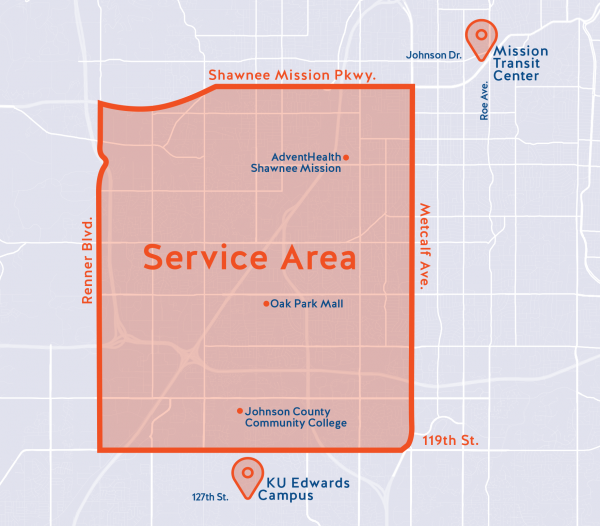 The service area also includes Mission Transit Center and KU Edwards Campus. Destinations include AdventHealth Shawnee Mission, Oak Park Mall and Johnson County Community College. Request a Ride: Anyone within the service area boundaries can summon a ride using the mobile app. Simply enter in your destination address. You may also book a trip by calling 816.512.5510 or at ondemand.transloc.com. Pay your Fare: You can pay the $1.50 fare for the trip with a credit card within the mobile app or with exact cash upon boarding. Enjoy the Trip: Your trip will be as direct as possible to your entered destination. 2. Open the app and review the available services. Choose the service you want to use by tapping "Book a Ride." 3. Confirm your pick-up location and select your drop-off location. These must be within the service's region paramaters shown on the map. Change your pick-up time by tapping “ ASAP” and selecting a new time and date to schedule your ride ahead of time. 4. Select the number of passengers with you, and if you need a wheelchair-accessible vehicle. Tap "Request Ride" when ready. 5. The first time you use the app, the system will require you to log in or create an account* with TransLoc (the company behind the app). *This is a free account, and your information will not be shared, however, you will need to include your mobile phone number if you would like to receive text message notifications. 6. Keep the app open to stay informed on your ride status.